During the six-month student strike, hundreds of banners were created to denounce tuition fee increases and protest the privatization of public institutions. These banners lead demonstrations through the streets of Québec’s cities. They affiliated neighbourhood resistance and demanded an end to police repression. Banners hung from l’Îlot voyageur and the Berri street overpass, and they fluttered above the demonstrators at CLASSE’s demonstrations the 22nd of every month. Include Your Banner in a installation/exhibit representing the Québec Protest Movement! Many banners hung over the facades of university and CEGEP buildings, while others blocked the entrance to Jean Charest’s Montréal office. If you have a banner tucked away somewhere and would like to include it in this giant quilt of dissent, I will humbly accept it and include it in the Counterpoint Quilt. Devant les bureaux de Premier Ministre Jean Charest à Montréal, printemps 2012. Photographe inconnu. One of my interventions as a striking student was to collect posters related to the strike for the Centre de recherche en imagerie populaire (CRIP). The creative abundance of the student movement that surpassed the poster, which inspired me to create a vaste digital archive on Facebook of visual artifacts from the strike: Imagerie d’un printemps érable. I have since changed my MA research-creation project to the production of a living archive of these artifacts that is (self)representative of Québec’s protest movement during the period of the strike. I invite you to look through the 26 photo albums to see more than 2100 images of posters, banners, placards, digital images, stencils, graffiti, installations, performances and other visual representations of the Québec Maple Spring. If you have information about any of the visual artifacts – like the photographer, the person who made the poster, the date of the demonstration is was used in – please let me know so I can add these details to the archival information. Banderoles au CÉGEP du Vieux-Montéal. Photographe inconnu. As I mentioned earlier, I am creating a protest quilt (Counterpoint Quilt) for an exhibit at Darling Foundry in December (details coming soon). I want you are your group’s participation in the protests to be represented within this work of installation art that I plan to organize a traveling exhibit to various campuses throughout Québec and elsewhere. The creation and display of the quilt aims to generate an affective source of collective forward momentum that nourishes the movement in a cyclical loop of (self)representation and renewal. This work of collective dissent will reveal the strength and creativity of a vigorous political battle that we can claim victrory due to our resilience and our omnipresence on the streets. Lors d’une manifestation au début de la grève étudiante 2012. Photographe inconnu. The banners I am looking for were made by student associations, community groups, APAQs, teachers unions, artist collectives and others active in the 2012 student protests and larger social movement like the ones seen above. If you have one or more banners to donate to this work of protest art, I will include it in the Counterpoint Quilt. Any other information you may have about the banner: the group that made it, the date it was made and for which particular demonstration/action, etc, would be appreciated. Anglo Canada is sticking its fingers in its ears and humming a happy song. Many in the English-speaking punditocracy and media (or perhaps mediocracy?) are doing their best to persuade us that student protests in Québec are nothing of any consequence. Step 1: Set the stage with a dismissive tone. Many like to scorn protesters as naïve over-entitled brats. If you really get huffing and puffing, brand students as anti-social radicals. This leads nicely into step 2. Step 2: Suggest a sinister undertone. Highlight any behaviour suggesting that protesters are undisciplined violent thugs. (Take care to frame this in a way that denies the possibility that the noble police force ever provokes any unpleasantness). Step 3: Explain WHAT IS REALLY GOING ON. This is your chance to look like you are magnanimously enlightening those poor confused students. Remember, it is your job to reassure English Canada that the status quo is entirely reasonable and the forces of authority radiate with the glow of legitimacy. Protestors walk north along Berri Street under the Sherbrooke Street overpass in one of Montréal’s nightly demonstrations prior to the introduction of Law 78. May 14, 2012. I went to McGill in the late 80s and early 90s when tuition fees were less than $1,200 a year, so with summer jobs and some parental help I graduated from my first degree debt-free. For my MA, which I took in Ontario, I worked part-time and graduated after one year with a debt of $10,000. By way of comparison: my partner went to university in Ontario after grants were eliminated, and when the first round of tuition fee hikes were implemented. He completed a BA and then an MA, and graduated with a debt load (and compound interest) requiring monthly payments of around $650 for 10 years. “Have you set up RESPs yet?” we’re often asked. Are you kidding—with both kids still in child care? And since we have fundamental issues with the RESP system, the public money it represents and how, like the RRSP system, it’s geared to the wealthiest families who can most afford to save, we’ll be exploring other ways—once child care expenses go down—to save for our kids’ education so that they can start their adulthood as debt-free as possible. Of course, if our house needs major repairs it promises to throw a huge wrench into “the plan”. Because for many of us, life is as precariously balanced as a three-legged stool: alter one element (like when I broke my leg last year, rendering me immobile for several weeks) and the whole thing threatens to topple. Our societies are likewise delicately balanced: educated societies are healthy societies; equitable societies are safer societies. There is no one panacea—these elements work together. And they need to work well together—which requires accountability, sufficient financing, transparency, and effective administration. So the question is not “health care or education, what’s it going to be?”; the question is, what do we need in order to create an equitable, healthy, educated and engaged society, and what’s the best, fairest, most efficient way to get it? It is within this context that we need to examine the rhetorical criticisms levied against the Québec student strike and the people involved. Tuition fees in Québec are the lowest in the country. What have they got to complain about? For everyone who missed yesterday’s family march against tuition increases and in support of a larger social movement against privatization of public services, here is a photo of seniors against tuition increases. Below are 2 videos from Occupy Montréal media. The first is from yesterday’s march that gathered up to 25,000 people on the streets of Montréal. This video includes images taken from a variety of recent protests from the student movement. The audio is from a passionate speech given by Julien Lavoie. The entire speech can be read on page 9 of Fermaille, the student publication from the Association Étudiante du module d’études littéraires (AEMEL-UQAM). This animation was made to help create solidarity between anglophone and francophone students across Québec in light of the contrasting scale and strength of our respective strikes. This contrast also seems to exist with regards to our respective “cultures of resistance”. In a province that has seen much mobilization surrounding language issues and sovereignty, the apparent omission of this debate from the larger contestation articulated during this student movement speaks to the possibility of a desire for unity along different lines. As Gabriel Nadeau-Dubois illustrates, these lines are class, race, ethnicity and gender; or a total view of class that includes these subject-positions in order to make the axes of power transparent in all systems of oppression. While there is room for the question of nationalism to become more visible in the broad, collective reflection we are hoping for, and naming “Printemps Québécois” (or “Printemps Érable,” or “Occupy Montreal”), the power of our uprising is to be found in its scope. Nadeau-Dubois is relied upon much less frequently in the Gazette, CBC, or CTV than in francophone media. While the tuition increase will be fought by the students collectively, he is a very eloquent spokesperson to have represent our interests in media settings that are typically hostile (and hostile to dissent that is not voiced by elected representatives, officials, heads of institutions.) He is also a skilled orator who speaks with passion and conviction. This video uses kinetic typography to amplify this energetic quality. by Tim Powell, Graduate Diploma Student, Communication Studies, Concordia University. It was a Monday morning just before 9:00 am. As I walked to the Charlevoix Metro, historically working class neighbourhood of Pointe St-Charles, the context within which the student strike was situated became blatantly clear. I was on my way to the Concordia University Graduate Students Association general assembly to update a commitment to an unlimited general strike. Across the street from the metro were the last vestiges the neighbourhood Société des alcool du Québec (SAQ) liquor store being dismantled. The local outlet closed its doors on March 31. For months, local residents have been campaigning for the store to remain open with public information strategies, posters in livingroom windows, protest demonstrations and a banner that spanned Charlevoix Street in view from the SAQ’s front door. "Don't Leave the Pointe: services in the heart of the neighbourhood" banner still spans Charlevoix street as a reminder that public institutions do not necessarily have community well-being as a priority concern. April 4, 2012. Like Premier Jean Charest, who maintains a deaf ear to student concerns that tuition increases will decrease accessibility to higher education and privatize public institutions of higher learning, the SAQ management couldn’t care less about community concerns. For them, the bottom line is king, but not the benevolent type who looks out for his subjects but rather type of king who wants more for less at his subjects’ expense. Banks closed their local branches in Pointe St-Charles decades ago in a mass restructuring bid to increase profits. Now, four times a year, Canadian banks proudly flaunt record quarterly earnings without flinching at the long-term side effects of their greed. In fact, governments praise them for their resilience and competitiveness. Only the cooperative Caisse populaire Desjardins remains to provide financial services to The Pointe’s residents. In 2007, Canada Post announced that it was to close the neighbourhood’s only post office. Community members decided this was unacceptable and protested the announced closure. Their efforts did not save the post office but it did keep postal services in the neighbourhood, with a postal outlet installed inside a local grocery store chain. Some battles for services are won and some are lost, but each battle needs to be fought to avoid losing everything. "Education is not for sale. Yes to the general strike." Photo March 22, 2012 by David Widgington. Every encroachment of capitalism into public institutions takes away resources from the public and transfers it over to the private, in a capitalist imperative for perpetual growth. Not the type of long-term growth that builds communities to improve society but the type of growth that bolsters private enterprise by increasing investment portfolios of a minority of individuals. Public-Private Partnerships (PPPs) that governments now vigorously advocate allow further encroachments of private interest over public good. PPPs provide public “investment” in infrastructure projects from which private corporations secure the profits. The extension of route 167 is one glaring example within the Charest government’s PPP approach to its Plan Nord. “A sharp increase in tuition fees is presented as the inevitable solution to an alleged problem of university underfunding. The facts analyzed [in the report] indicate that such an increase is actually a political choice aimed at privatizing the funding and role of universities. We are currently experiencing a number of crises (environmental, economic, cultural). Given these circumstances, we should be using our intellectual efforts to reinvent the way we live and inhabit the world. Yet the transformations we see being imposed on universities actually undermine their independence and make them simple accessories to the unrestrained and irrational economic growth. Learning institutions are reduced to intellectual entrepreneurship centers that orchestrate the shift to a system ruled purely by economic considerations. As is stated in our collective piece, we do hope Concordia University’s higher administration will consider reversing its current approach and instead commit to engaging in dialogue with students and faculty so that “strike” concerns can be addressed. Yesterday, April 2, 2012, Concordia students occupied the 15th floor of the John Molson School of Business building. Their demands included academic amnesty for striking students and for the university to state their official position against proposed tuition hikes by the Charest government. Still image from The Link video of April 2, 2012. Frederick Lowy must certainly know that there are indeed funds available, if only the Charest government would prioritize accessible higher education rather than subsidize mining corporations. Here is just one particular source of funds that could (and should) replace the total sum of $265 million tuition fee increases  that the Charest government proposes. Consider this example from the Québec 2012-2013 budget: a $332 million grant of public funds is made available to extend route 167 so that the mining corporation, Stornoway Diamonds, can access public land for mineral extraction. Stornoway is only paying a fractional $44 million for the construction of a permanent road that leads nowhere else than its future mine. Why is québécois society subsidizing this corporation to extract a non-essential mineral from public land?! Why has Premier Charest not consulted the public to ask us whether or not we would prefer to maintain and improve accessibility to higher education rather than to subsidize the profit margins of private corporations?! Would this money not be better spent on education or healthcare or anywhere else with longterm benefits for Québec citizens rather than for short-term dividends for corporate shareholders? It is time for university administrators like Concordia President and Vice-Chancellor Lowy to break their silence. They must assume their roles as leaders of our public institutions to pressure Premier Jean Charest and Education Minister Line Beauchamp to begin dialogue with the student movement. Frederick Lowy should lead the way with his vision for zero fees for higher education in Québec. All of Québec society — students and otherwise — should ask ourselves: Is it more beneficial for society to give money to private mining corporations so they may access public land for the extraction of gold or diamonds which are often socially and ecologically costly and only serve the interests of luxurious consumption and capitalist financing? Or is it more beneficial to take that same money and give it to public institutions to maintain or improve accessibility to higher education? Now is the time to decide! 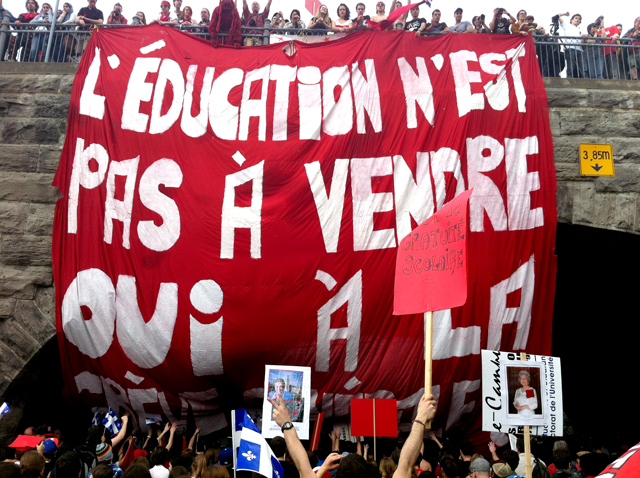 Éric Martic and Simon Tremblay-Pépin (2012) Do we really need to raise tuition fees? : Eight misleading arguments for the hikes. Institut de recherche et d’information socio-économiques (IRIS) p.3. This text is taken from the Stornoway website (viewed April 3, 2012).